Life is all fun races with cute boys until Mom says it’s time to get hitched. Georgiana was married in June 1774, so the film must start a few months before that. Her first dress is a robe à l’anglaise, the French reincarnation of the English nightgown. It’s rather fashion-forward for 1774 — most English women would still be wearing nightgowns, which would be cut as seen here, but with a pleated center back that is cut in one piece between the bodice and skirt. It would also be more appropriate to 1774 to have an open front bodice with a stomacher. 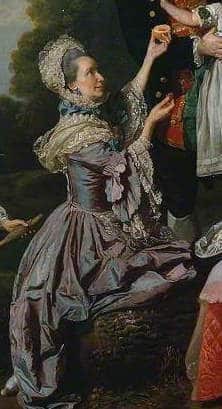 The style she’s wearing, without the pleated back and with the bodice closed center front, is a bit more 1780s than 1770s. What would probably be more typical of c. 1774ish — dresses with stomachers. 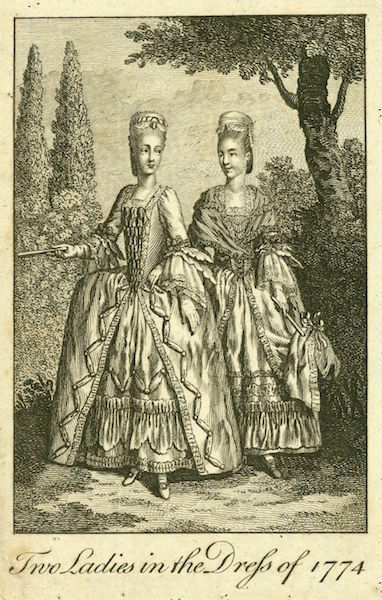 “Two Ladies in the Dress of 1774,” probably from the Ladies’ Magazine. 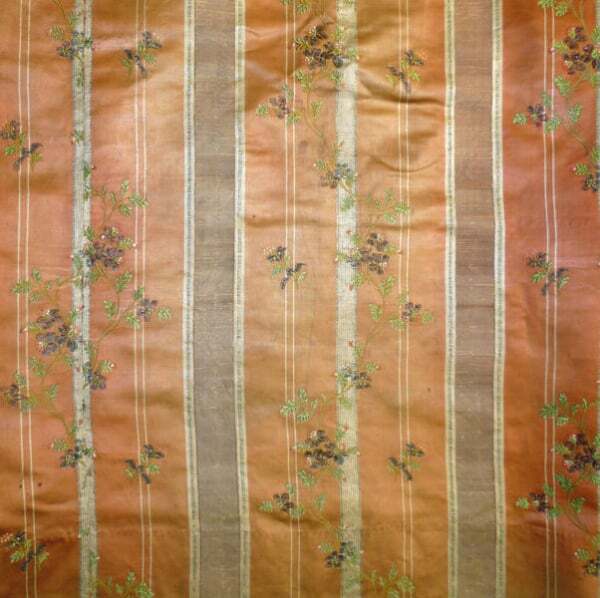 The fabric of the dress is a subtle brocaded self-stripe, meaning there’s a floral pattern woven into the fabric as well as woven stripes. The pale blue color is certainly fashionable, and works well for making Georgiana look young (she was 17 when she got married). Brocaded stripes were super fashionable for women’s dresses in this period. Robe à la piédmontaise, 1770s-80s, Victoria & Albert Museum. The elbow-length sleeves with cuffs are typical of the era. The center-front bow was called in French a “parfaite contentement” (perfect contentment), but I’m not sure if it had a name in English. 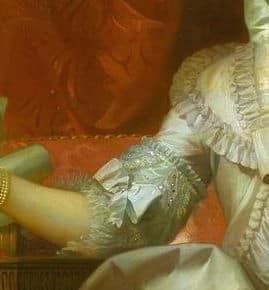 The trim is a purchased “rococo braid,” which is a modern, machine-made approximation of what the knotted, woven, and braided trims used in the period. Reproducing those period trims would be painstaking and require only handwork, so I think using rococo braid makes sense. It gives the right effect without 3000 hours of labor. I’ll nitpick and note that the gown closes with hooks and eyes at the front. Hooks and eyes were VERY OCCASIONALLY used in the era. What was much more common was for the gown to be pinned or basted closed. However, this is a film production — they need to be practical, so I’m glad the hooks and eyes are super subtle (note that they match the gown color). Here’s what that kind of trim would look like in the period (although there were many different variations). 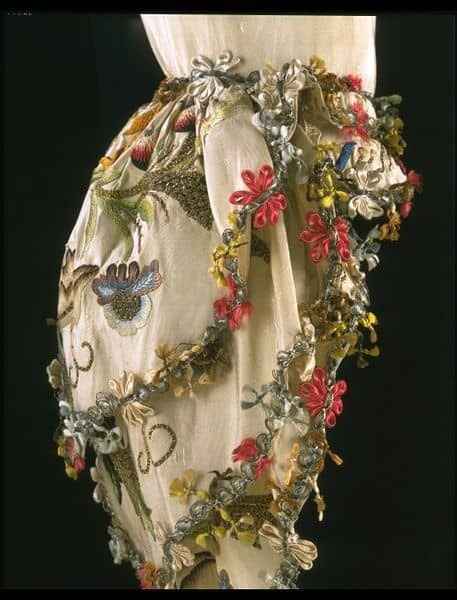 Sack Back, 1740-69, Victoria & Albert Museum. I like the silhouette of the gown. It’s a pretty informal occasion — Georgiana is basically entertaining some friends of her own age. But there is clearly some kind of hip padding going on. This was a transitional era between side hoops and bums/rumps (hip and/or rear pads), and I like that they emphasized the hips but kept it subtle. A similarly hip-emphasized, but not too big, silhouette. 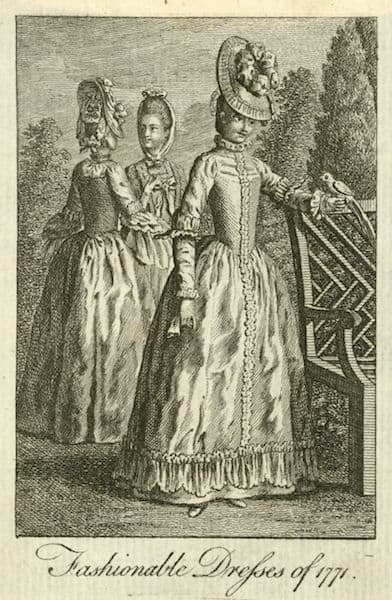 Fashionable dresses of 1771, probably from the Ladies’ Magazine. I have questions about Georgiana’s hair. The silhouette in the early- to mid-1770s was much more about height on top of the head. I know they’re trying to keep her hair simple here in order to contrast it with the huge hair she’s going to wear to her wedding, but the overall rounded silhouette looks much more 1780s than 1770s to me. That being said, her hair is 1. UP (more than 2 bobby pins were used in this film!) and 2. the ringlets hanging down are very typical of the era. The bit of poufy froof on her head would be considered a “pouf” in the period. It’s more suited to an indoor event, and she should be wearing some kind of hat like the other girls in the scene. However, from a filmmakers’ perspective, not wearing a hat 1. differentiates Georgiana from the other girls, and 2. allows us to see more of her face. 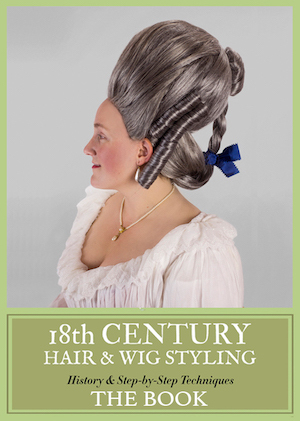 A much more typical mid-1770s hairstyle. The Light Guinea, or, the Blade in the Dumps, 1774. 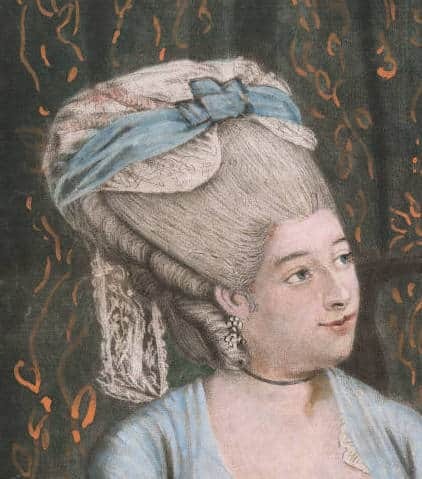 18th century makeup was all about the cheeks. You see a lot of color there, more or less depending on how formal the occasion was, plus some lip color and darkened eyebrows. Georgiana looks spot on for an informal event — just a teeny bit of cheek and maybe lip color. What’s your thoughts on The Duchess‘s first dress? 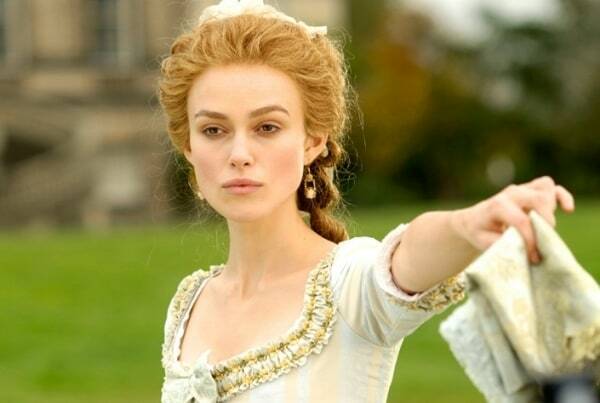 Will you do a Marie Antoinette series afterwards? YES PLEASE. Sofia Coppola’s Marie Antoinette is full of stunning costumes which look period-accurate, but I would like to see an in-depth, nitpicky review of them. Also, I loved that movie. I’m a lurker of a few months and always love your posts, but this makes me so excited! 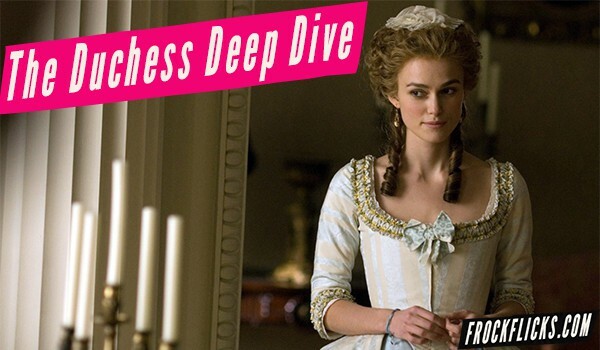 The costumes in The Duchess are easily my top picks, and I’m loving the in-depth analysis. Thank you! I love this Deep Dive idea! Excited to see more! In the second picture where the skirt whirls away as she turns–what’s going on with the lining of the dress? Looks like swaths of grey/green and rose. Was it common to have a different pattern underneath? The striped lining is my favourite part of this dress. It stops it from looking like a cpmplete Laura Ashley couch. There’s a dress in a museum collection that has a skirt lining in a similar color scheme. My memory is failing me as to which one it is, but I’d bet that’s where the costume designer got his inspiriation. Hey, good catch, I just noticed that! However, this would have been a very uncommon practice at the time, it just wasn’t a fashion then. I’d be very interested to see in-person the example Andrew mentions to see whether the lining is actually original or a later addition – the Victorians had a tendency to re-make original 18th century gowns according to their own ideas of “Rococo” to wear for fancy dress. Omg I am here for these deep dives hunty! I think the thought process behind showing her sans-hat was to show that she is at home and the other characters are the guests, which is more of a Victorian idea than a Georgian one, but whatever. I’m excited to see what you’ll have to say about that teal dress she wears in Bath and and accompanying phallic hairdo. It is correct to have such a deep neckline on a day dress worn outside? The period illustrations show the ladies all covered up. I love this idea! I am so excited for the series! This is such a great idea, I’ll be so looking forward to more of this!